Riverfront Park officials have blocked the sidewalks along the powder blue bridge overlooking Spokane Falls after engineers determined the edges of the span no longer can be assured of holding pedestrians. 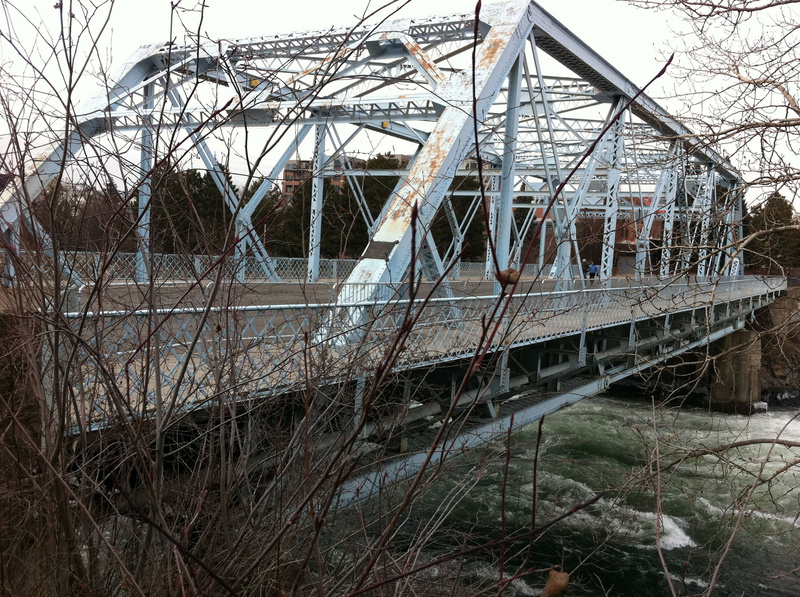 However, bridge engineers have determined that the main portion of the bridge – which used to handle vehicle traffic of Howard Street – remains strong enough to hold pedestrians and light vehicles. Park staff erected temporary metal barricades in front of the sidewalks soon after receiving a letter describing the problems on Jan. 12. The Howard Street bridge over the middle river channel, which is nearly 100 years old, is the second Riverfront Park bridge to be barricaded to prevent overloading. The middle part of the southern Howard Street Bridge – near the Rotary Fountain – has been blocked since 2009. Riverfront Park Manager Craig Butz said the former Howard Street bridge over the north channel does not appear to have structural problems. The three Howard Street bridges mostly have served pedestrians since car traffic was closed off for Expo ’74. Butz said the future of the bridges will be examined in the next year as the department begins work on a new Riverfront Park master plan. He said with a proposal for a science museum in the park dead and demolition of the former YMCA imminent, officials need a new direction. “We were waiting for decisions and those decisions have been made and it’s time to work on the next 20 or 30 years of the park,” Butz said. Park Director Leroy Eadie said officials will examine the cost of removing the sides of the bridge and placing new barriers up along the bridge, but he said it’s unclear that solution would be cost-effective or even possible. In the long run, the department will need to decide if the bridges should be replaced by pedestrian-only spans or ones that can handle vehicles.